When we talk about Russian imperial jewels here, we're usually talking about pieces that were lost or were acquired by other royals. But some of the Romanovs are still around today, and occasionally they attend major events wearing Russian-style jewelry. Today, we're talking about the pearl kokoshnik worn by Maria Vladimirovna, one of the pretenders to the Russian throne (and claimants of the headship of the House of Romanov). 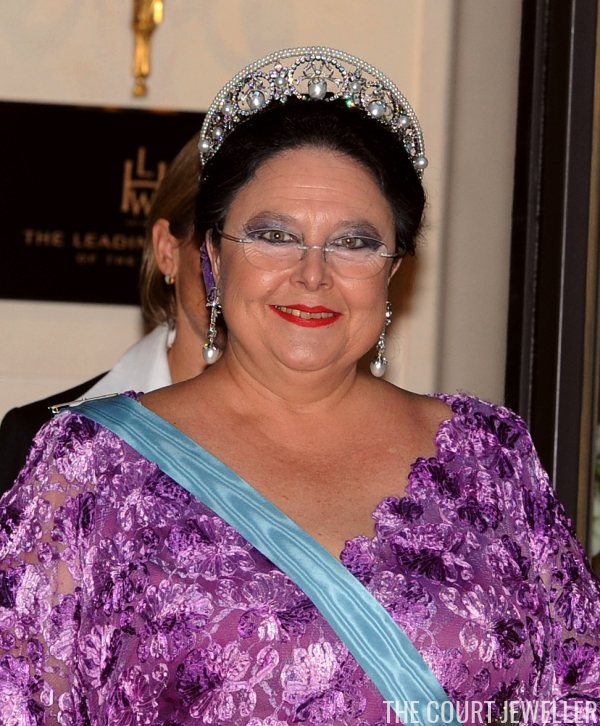 Maria Vladimirovna is the granddaughter of royals we’ve talked about on the blog: Grand Duke Kirill Vladimirovich of Russia and his wife, Princess Victoria Melita of Edinburgh. Kirill was the most senior male member of the Romanov family to survive the Russian revolution, and during his lifetime, most (but not all) recognized him as the head of the house — some even considered him to be the rightful tsar. After his death, his son Vladimir Kirillovich followed in his footsteps. Vladimir was Marie Vladimirovna’s father; he died in 1992. Her right to the position of head of the House of Romanov has been disputed by many, for several complicated reasons, but this year, the head of the Russian Orthodox Church recognized her claim. Who knows — the jockeying for position within the surviving Romanovs has always been a tricky business. 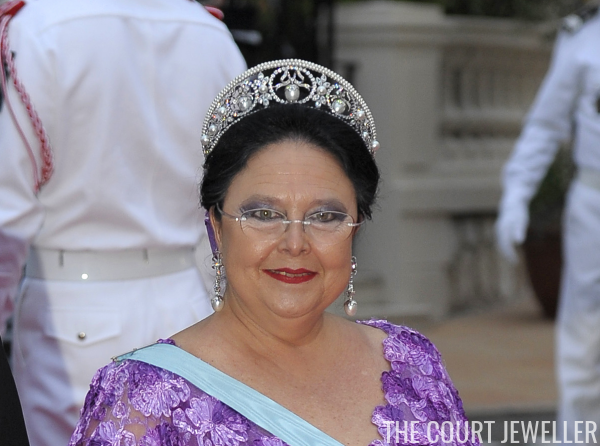 Like its owner’s claims to be the preeminent Romanov, this tiara’s legitimacy has also been questioned — some suspect that it’s a fake. Set with stones that look like diamonds and pearls, with rows of smaller pearls across the top, the tiara echoes the jewelry of Romanovs past. But it’s entirely possible that the piece is indeed set with synthetic stones. Unless experts get a closer look at it, we’ll probably never really know for certain, though I tend to side with those who believe that the tiara is not set with precious stones. 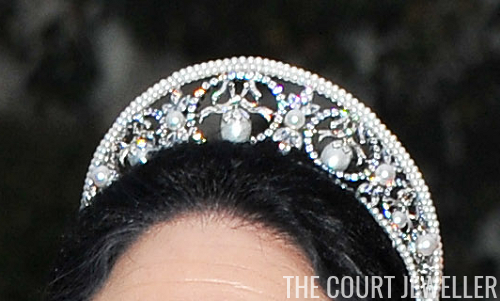 While Maria Vladimirovna has worn several other tiaras during her life, this is the piece she reaches for most frequently these days. In 2011, she wore the piece to two major royal weddings: the wedding of the Prince and Princess of Monaco, and the wedding of Prince Georg Friedrich and Princess Sophie of Prussia. (MV is a cousin to the Prussian royals through her aunt, the late Princess Kira.) It’s always fun to see a Romanov pop up at one of these big royal bashes — even if her claims are a bit shaky and her tiara is possibly fallalery.